For next week's Food News column, Hannah is writing about Table 613, the new Kosher restaurant in Sanderlin Center. I tagged along with her to check it out for lunch. Hannah started with the Matzah Ball soup ($4.99). It smelled wonderful, and Hannah said it was very good. 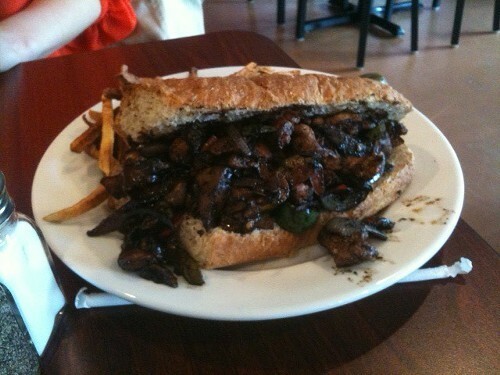 She also ordered this bulging grilled chicken sub ($9.99), which was topped with onions, peppers, mushrooms, jalapenos peppers, and a savory sauce. 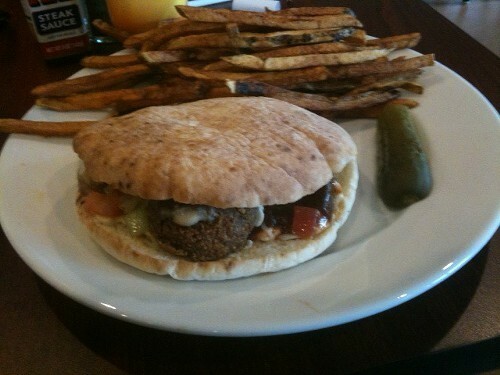 I ordered the falafel pita ($7.99). This is loaded with hummus, eggplant, and babaganoush. Very tasty. The menu also includes a number of salads, from Caesar to broccoli cashew. There's also a the quarter-pound Butch burger and a Schnitzel sandwich, plus sides, a kids' menu, and a small selection of desserts. Table 613 is open Sunday through Thursday, 11 a.m.-9 p.m. and Friday 11 a.m. to 2 p.m. The downtown bar Kudzu's has been chosen as the dive bar of the month for February by Dive Bar Shirt Club. The Dive Bar Shirt Club is what it sounds like. For $22 a month, members receive a T-shirt with the chosen bar's logo, plus the bar's vital stats. The club is run by Cody Shoemake and Mike Edwards, who are based in Florida. Shoemake got the idea from a surfer shirt club he belonged to. So what makes a dive bar? "That's tricky," says Shoemake. "There are 11 different answers." Dishcrawl Memphis hosts its first event on Tuesday, February 5th in Cooper-Young. Dishcrawl was launched in San Jose, California, a few years ago and has since expanded to other cities across the country as well as Canada. 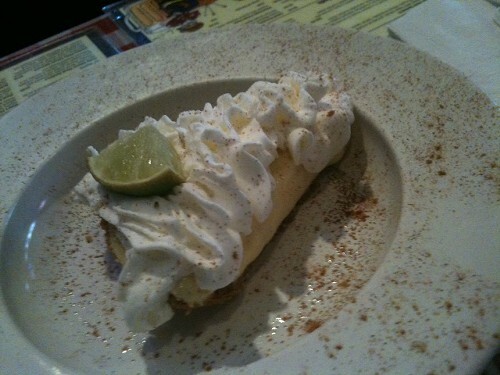 Technically, the February 5th crawl is Dishcrawl Memphis' second first event. According to Dishcrawl Memphis' ambassador Paige Laurie, tickets for a crawl on Wednesday, February 6th, sold out within three days, so more spots were added and the Tuesday night event was added as well. This will be Laurie's first crawl as well, and she's excited. She sees potential for crawls on Madison and downtown. "There's a lot of pride in the food community," Laurie says. "We don't just stop at barbecue." Tickets for the Cooper-Young crawls are $45. Meeting location is kept a secret until 48 hours before the event. The crawls start at 7 p.m. For more information, go to dishcrawl.com/memphis. 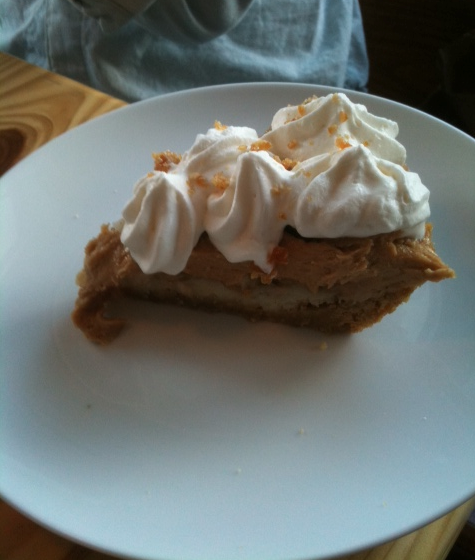 Yesterday was National Pie Day! 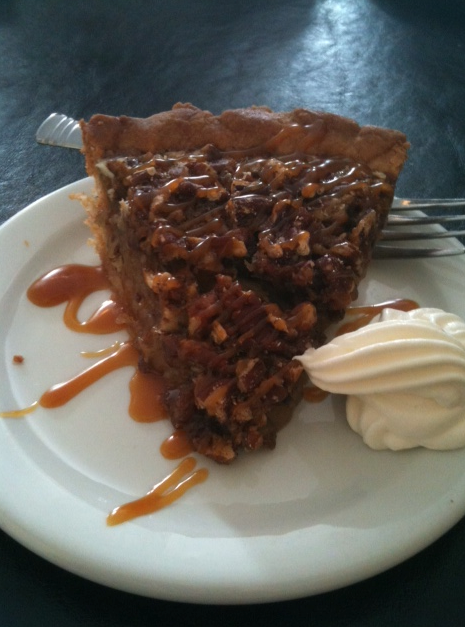 In observance of this important national holiday, Muddy's Bake Shop offered free pie from 2 to 6 p.m. yesterday. The good news? People love pie! Especially free pie! The bad news? 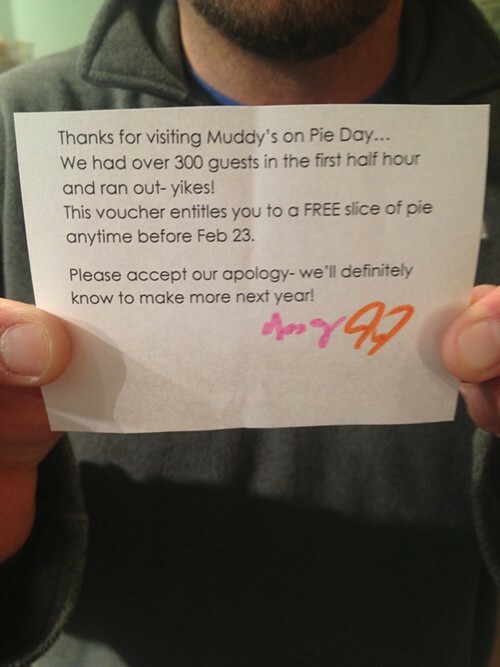 People love free pie so much that Muddy's ran out of pie within the first half hour. The good news? Muddy's offered everyone who missed out on free pie some tasty honey rosemary cookies and chocolate chip cookies and a voucher for a slice of pie in the future. 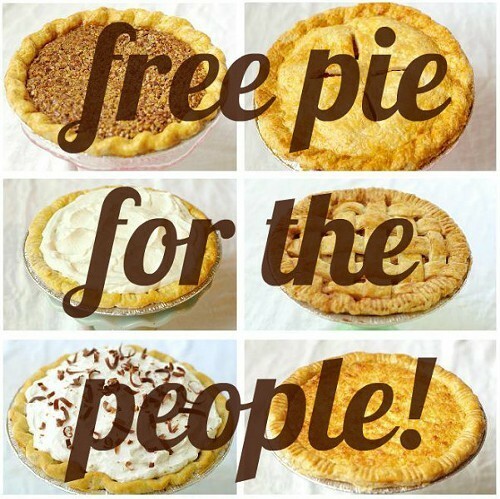 Free future pie! Muddy's Bake Shop Owner, Kat Gordon. 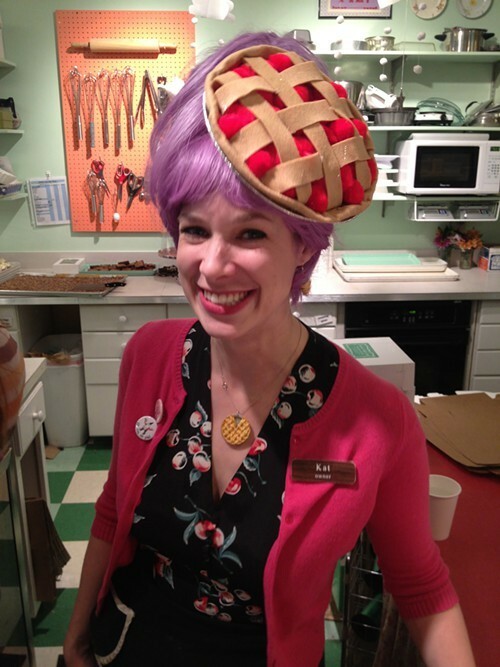 Owner Kat Gordon, decked out in her customary pie-themed garb, said she had hoped to offer a free pie buffet so that guests could sample as much pie as they wanted. And so it was for the first guests who arrived, but Gordon vastly underestimated this city's apparent love affair with free pie. "This is just the first year, though," she says. "We're learning, and we'll be back with more pie next year." 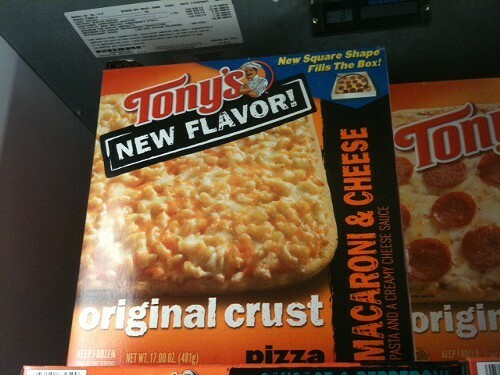 "The pie-sibilities are endless!" — that groaner courtesy of the American Pie Council in honor of National Pie Day today, January 23rd. You might of heard that Muddy's is offering up free slices of pie at Muddy's today, from 2-6 p.m.
Me, I'm taking this op-pie-tunity (sorry!) to do a photo dump. 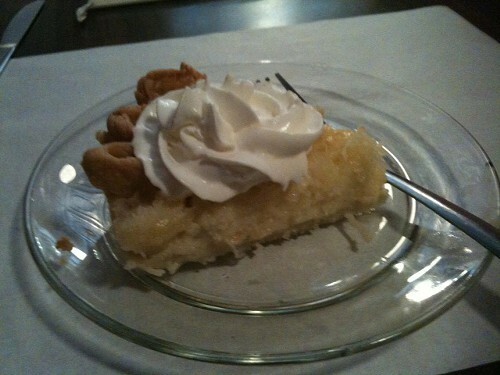 Who serves your favorite slice of pie? • On Sunday, January 20th, 5-9 p.m., at the Racquet Club, it's the third annual Italian Winterfest, a benefit for the Catholic Education Scholarship Fund and residents of the Ave Maria Home. Serving it up at this event are: Pete & Sam’s, Garibaldi’s, Folk’s Folly, The Rendezvous, The Italian Rebel; Frank Grisanti’s, Coletta’s, Lucchesi’s Pasta, and Ciao Bella. And, of course, there will be plenty of wine. This year's Winterfest is dedicated to event co-founder Sam Bomarito of Pete and Sam's, who passed away last year. Tickets are $40 in advanced, or $45 at the door. For tickets, contact, Lisa Bell at 405-3791, lbell@avemariahome.org or Mary Helen Carmack at 373-1205, maryhelen.carmack@cc.cdom.org. • Also on Sunday, from 4 to 6 p.m., it's the Iron Shaker Cocktail Competition at Hog & Hominy. Four teams compete in an Iron Chef-like contest, creating cocktails from 3 of the 5 secret ingredients provided. Team leaders are Michael Hughes of Joe's Liquors team; Jayce McConnell of Snackbar in Oxford; Anna Katherine Metzger from 12Bar on Beale; and Nick Talarico of Hog & Hominy and Andrew Michael Italian Kitchen. Guests receive a welcome cocktail from each team and vote for a winner the People's Choice award. Tickets are $30 and available at Hog & Hominy. Proceeds go to Grow Memphis. *FYI, Hannah Sayle will be a guest on this week's Local Color on WKNO. It airs tonight, January 17th, 8:30 p.m.
A reader sent me a tip about Elwood's Shack, a new restaurant in the old Pizza Shack next to the Lowe's at Perkins and Summer. Elwood's Shack — named for the Blues Brother character and opened 15 days ago by restaurant vets and fishing buddies Scott Scheno and Tim Bednarski — serves breakfast and lunch, and while the menu is still in flux, as it stands now, it's quite extensive, serving everything from sandwiches (meatball subs, reubens, the vegetarian Going Back to Cali), barbecue (barbecue nachos, beef brisket, etc. ), and pizza (traditional pepperoni, Elwood's Meat with country ham, bacon, sausage, and meatballs ...). I ordered a grilled cheese, a classic made with American cheese, with a side of potato salad (very good). 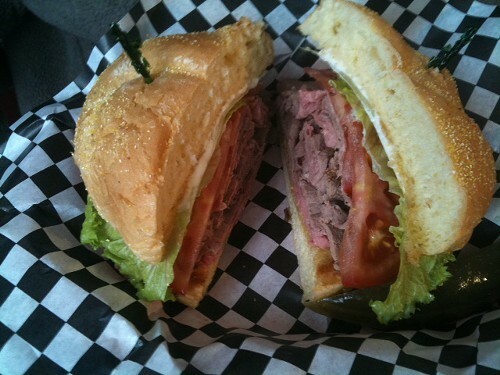 Hannah opted for a roast beef sandwich (above), which came stacked with house-made roast beef. The two sandwiches with drinks and a side came to about $14. Can't beat that. Elwood's shack is open Monday-Friday, 6 a.m.-4 p.m. and Saturday, 7 a.m.-2 p.m. Here it is all wintry mixy and I'm without a single slice of bread and nary an egg or drop of milk. But I'll be all right. 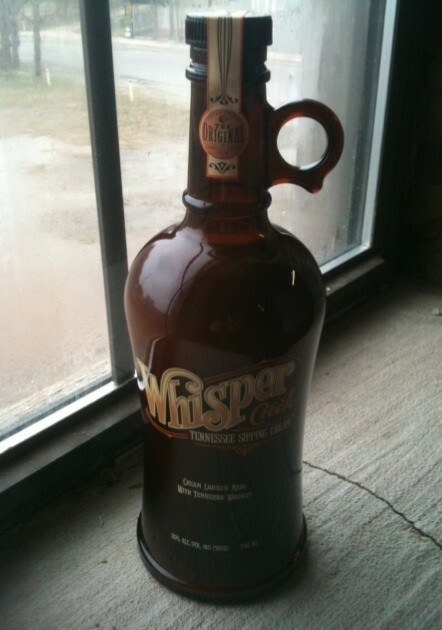 I've got Whisper Creek Tennessee Sipping Cream. A sample arrived in a small wood crate with a prying tool. Bianca turned me on to Derae Restaurant. This is an East African/Mediterranean place on Highland just a block or so south of Park. 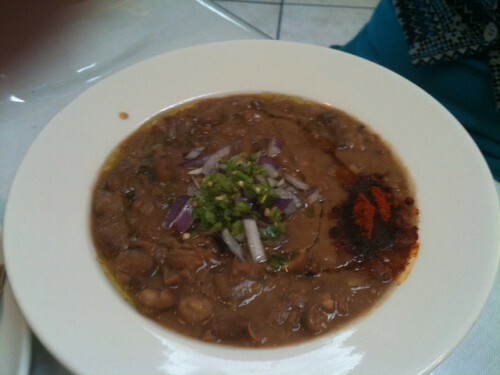 The restaurant serves breakfast, and we started with a dish from the breakfast menu — bowls of fuul ($6), a nice and hearty chili-like dish of fava beans and other vegetables. 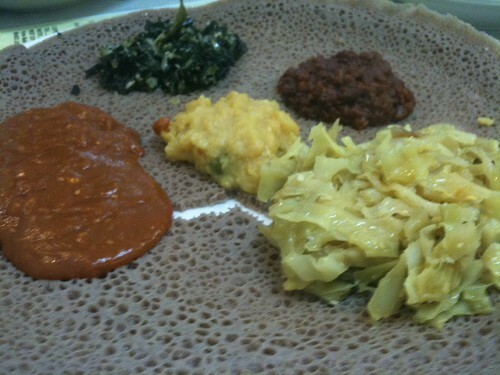 We also split the veggie combination platter ($12), an Ethiopian dish with kale, split peas, lentils, and cabbage served atop injera bread. 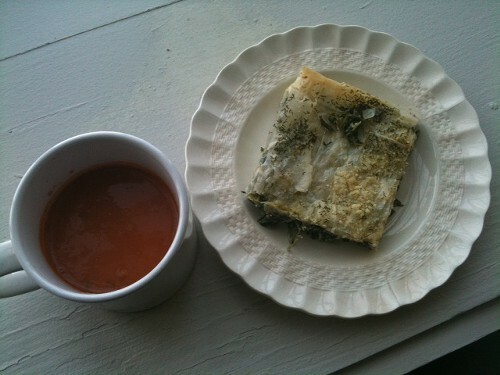 Excellent all the way around, and don't skip the specialty hot tea. 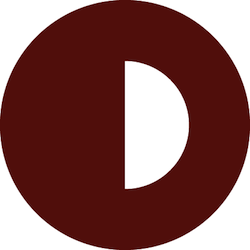 Derae Restaurant is open Tuesday-Sunday, 8 a.m.-6 p.m. Listen, it was bound to happen. There was nothing you could do to stop it. No need to get so upset. The original Sekisui, which opened in 1989 at the Shops at Humphreys Center, is moving on. A new space has been secured at the Regalia Center where Circa was located. "Our main objective was to find a nice location as close as possible [to the Humphreys location]," Lindsey says. The Regalia restaurant is just a mile or so away from the Humphreys location, so that loyal customers won't have to travel far. Lindsey says that the staff from Humphreys will be making the move to Regalia as well. He also notes that the new location is also ideal in that Sekisui will not be competing with another Sekisui. The move is now taking place, and changes will be made to Circa to transform it into a Japanese restaurant. Lindsey says details are still be worked out, but he doesn't think there will be hibachi at the Regalia restaurant. They hope to be open by mid-February and will be posting progress reports on their website sekisuiusa.com. As for Circa, the restaurant closed last week, but has announced, via Facebook, plans to reopen around the same time as the new Sekisui, the middle of next month, in a new space on Poplar. I was introduced to the deep-fried strawberries ($6.95) at Johnny G's Creole Kitchen while working on a story for Memphis magazine's February Dining Issue about the Tastin' Round Town tour. 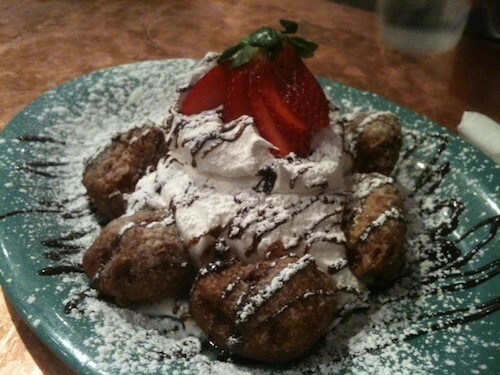 The strawberries are dipped in batter and flash-fried and then placed around a ridiculous amount of whipped cream and accented with powdered sugar and chocolate. The tour's leader Limo Lance described them as "silly good," and while I had my doubts, they are indeed silly good. The warm strawberries are a revelation, and all that other stuff — the beignet-like batter, the whipped cream, etc. — makes this dessert that much sweeter. 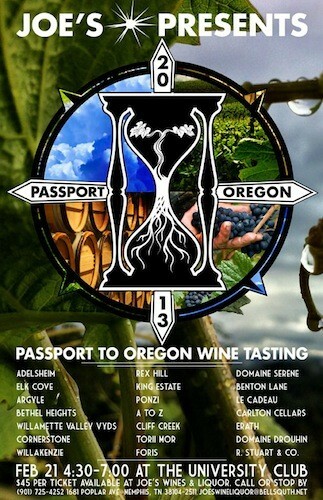 • Joe's Wines & Liquors' 2nd Annual Passport to Oregon Wine Tasting isn't until February 21st, but you'll want to secure your tickets today, as the first year's event was a sellout. The tasting highlights the wines of Willamette Valley. Among those scheduled to appear are Michael Adelsheim of Adelsheim Vineyards, Adam Campbell of Elk Cove Vineyards, and Rob Stuart of R Stuart & Co. Winery. Passport to Oregon, Thursday, February 21st, 4:30-7 p.m., will be held at the University Club. Tickets are $45 and can be purchased at Joe's. For more information, call 725-4252. • On Thursday, January 10th, 4-7 p.m., the newly open Cooper Street 20/20 will have an open house. The business, at 800 S. Cooper, sells grab-and-go items, such as hummus, soups, sides, entrees, and more. The open house will include samples of the food and wine. • On Saturday, January 12th, 3-5 p.m., the Booksellers at Laurelwood will be the site of the latest Memphis Cash Mob gathering. The beneficiary is Project Green Fork. The goals of the Memphis Cash Mob are simple enough: support local businesses and get like-minded folks together. 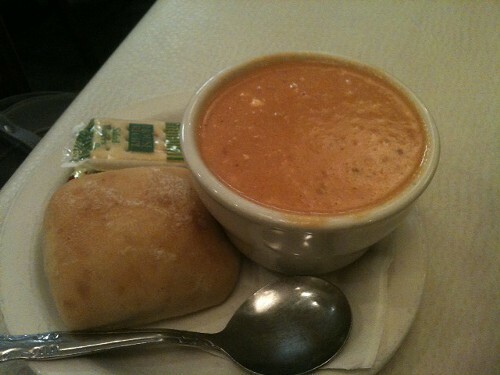 I've been souping a lot these days, and any Memphian worth her spoon knows that one must of any soup marathon is the Tomato Blue Cheese at Booksellers Bistro. This long-time favorite is rich and creamy, a fine indulgence that will set you back $3.95 for a cup or $5.95 for a bowl.